Scott Walker jumped into the 2016 Presidential Race today. The Wisconsin Governor is the 15th Republican to declare his candidacy. Above is Gov. 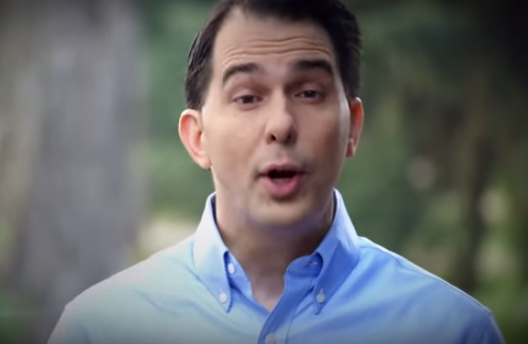 Walker's initial campaign video - and it contains some crucial body language misdirects which will play a pivotal role in preventing him from winning national office (however there is time to correct them). Scott Walker has droopy eyelids - the medical term for this is "bilateral ptosis" - a condition he most likely had when he was born (thus "bilateral congenital ptosis") or developed early in life. And although he has been able to twice win a gubernatorial race of a mid-sized state and survive a recall - the unintended nonverbal signals transmitted due directly from his congenital ptosis will prevent him from winning the Presidential election and with a very high probability the republican primary as well. People will often misinterpret others' with bilateral ptosis of being constantly tired. And a low-energy persona is certainly a huge rapport destroyer. Others will get false feelings of constant aloofness. Moreover when a person is feeling (and projecting) even subtle anger, contempt or disgust - partially closing the eyelids will amplify these emotions. Of course we all (along with Governor Walker) feel these emotions from time to time and (hopefully) do well to contain them. However when one has droopy eyelids - people will interpret the levels of these emotions to be much higher than they truly are - and thus the observers will take on similar feelings. The far right likes (even adores) Governor Walker - there can be no doubt about it. The far left can't stand him - no head scratching there either. Yet to win a national election a candidate from any party must capture a substantial portion of the center 1/3 of the electorate. These independent voters - more so than the political extremes - are governed by a candidate's likability - and the primary component of likability is body language. All things being equal, a person with bilateral ptosis is significantly less likable. There is of course enough time for the Governor to get plastic surgery. And while cosmetic surgery is dramatically over used - this is one example of a surgical procedure which will profoundly change the way people think and feel about another person's character. There's many other nonverbal signals in this campaign video - what other fundamentals did you see? Which are rapport-building .... and which (other than the ptosis) are rapport destroyers?